Simon Goodman reviews an unusual dramatic take on the 'refugee crisis'. 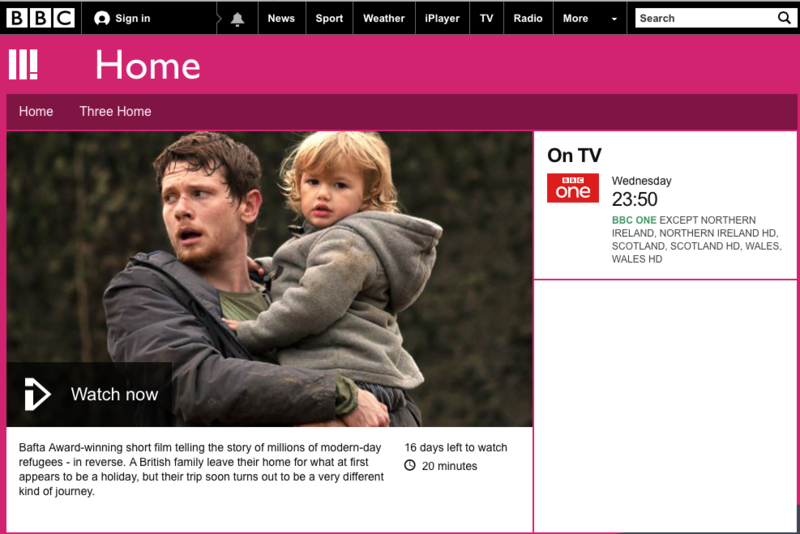 Home, available on BBC Three (and on BBC1 on Wednesday 10 May at 11.50pm) offers a powerful and intriguing unusual take on the 'refugee crisis'. It differs from most representations of refugees because the aim of this fictitious short film is to challenge one of the main ideas about refugees, which is that they are somehow different from you and me. The film follows a very ordinary British family, with two small children, undergoing the perilous journey similar to that which many of the 65 million refugees in the world, and the millions that have recently fled Syria for the relative safety of Europe, have to undertake. While this family’s journey is in reverse (leaving the UK for Kosovo), it is impossible not to feel for this family as they are forced to hand over their children to be hidden in the boot of people smugglers’ cars and later cross countryside with gunshots all around them. The empathy that this film generates for the family, which is no doubt the film maker’s aim, is incredibly important because empathy for refugees has been shown to be so lacking in most representations of refugees. Home shows that anyone – terrifyingly including us – can become a refugee, and the refugees who’s struggles we can see on the news are the struggles of ordinary people forced into extraordinary situation, simply doing their best to survive. What makes this film so powerful is the subverting of the standard ‘us and them’ distinction that is so often applied to refugees, showing that ‘they’ could easily be ‘us’ showing us, as Steve Reicher has argued elsewhere in The Psychologist, that refugees are simply people and that the category refugee itself can be problematic. This, in combination with the empathy for the family that their terrible situation generates, serves as a reminder that the current 'refugee crisis' is not a European crisis, but it is a humanitarian crisis. - Reviewed by Simon Goodman, Coventry University. Find other psychological perspectives in our archive.